So, this afternoon I came home to make an iron filled dinner. I roasted veggies, primarily broccoli & Brussels sprouts, heated up some kidney beans, and defrosted a mini turkey meatloaf. I loaded it up with salsa, a little cheese, and a 100 calorie Wholly Guacamole packet. 2) Mix all ingredients together. Add salt & pepper to season. These look really good! I’m normally turned off by the idea of meatloaf, but these actually sound very tasty. That’s interesting that there is oatmeal in them! I have always hated meatloaf, but had some ground turkey in the freezer and wanted something I could freeze. A lot of meatloaf recipes use bread, I adore oatmeal. I will put it in just about anything! The only thing I didn’t add in the recipe is spices. I used Mrs. Dash herb and garlic and some salt and pepper, but it could be really good with curry or cumin also! Found it at Target for $12, it was a great purchase! Between things like this and little breads or cakes, its fantastic. Thank you! And they freeze really well, too. I am 100% making these tonight! Thanks for sharing! You’re welcome! I just realized I didn’t add any spices, but I stuck to some Mrs. Dash, salt and pepper. Ooh thanks for sharing! I’ve never made a meatloaf before but I am seriously tempted after looking at these 🙂 Hope it did the trick! 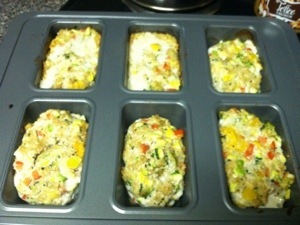 Those mini-meat loaves look good!! Thanks! They are quite tasty! I like having the option of adding other protein or grains or using 2 to be filling. And they freeze really well!